Some supply lines linked to mines seems to be transporting food at maximum rate, the net supply report on city side is not showing this though. Also, if you capture AI controlled mine filled with workers, you get an empty mine. If it's filled with slaves, you get their slaves too, with a pack of 480 food they are carrying. Is this a feature? or the mines actually requires food to operate? I'm working on the assumption were talking of the Gold version here and answered as such. if a mine with workers is captured the workers are routed and return to their home city. 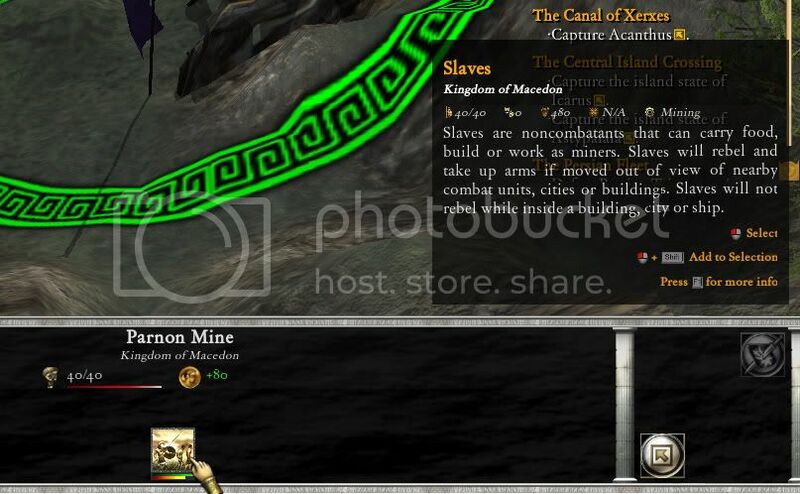 if a mine with slaves is captured, it seems you sometimes get the slaves but not always, and they may or may not happen to be carrying food, thats just incidental. mines dont require food. but supply routes between a city and farm seem to work both ways. if you have more troops in the vicinity of a farm than the farm can support extra food it will come from the city (you also get reenforcements, which i think is new but not 100% sure) and the supply shows a negative figure. i dont know, but maybe that works close to mines also. cities net supply display seems to be bugged and its something ive been meaning to post about. the total displayed doest add up to the figures in the breakdown when u hover over it. the net figure can even be in the high positives, higher than the garrisons needs, but the cities stockpile can be dropping. this is all from casual obeservation i havent properly checked these facts or documented them properly which is why i havent posted them yet so i cant vouch for the accuracy of what i'm saying, just that it appears to be this way. I've noticed as well that sometimes that display is a little buggy. Like, for example, food is coming in at a rate of 80+ per week, while a garrison needs 15 food per week. However, even though the incoming supply is far greater than the demands, the food stockpile doesn't go up at all. Sometimes the city is just passing the food along to a city that needs it further away. Also, as I had posted in my idea thread, in many of my games I literally cannot store any more food anywhere in my empire - So much that is coming in is disappearing and being wasted. I don't think it was, because its supply was low enough below its target that it would be keeping all it got. Nor was that noted on the little list tracking incoming and outgoing supplies. Plus it was at the end of the supply line at the time anyway. I've looked for a variable to increase storage capacity of cities, but short of modifying their populations directly and affecting other things, I haven't found anything. It'd be nice if we could pay gold to expand storage, just like we can to upgrade supply lines. Now I'm pretty sure slaves in AI-controlled mines will have exactly 480 units of food with them.